Refuge Temple got its start in the home of Deacon Sandy and Sister Lillie Bell Coleman in the late 1930s. The Colemans had been attending a church where Elder G. B. Briley was the pastor. Unhappy with the doctrine being taught by Elder Briley, the Colemans conducted services in their home. Mother Darthula Norwood heard about the meetings and asked Bishop R. C. Lawson to send a preacher to Georgia. The first minister that Bishop Lawson sent was Elder J. R. Reese. Under Elder Reese’s leadership, the meetings became too big for the Coleman home and a little storefront at 311 Lee Street in Atlanta, Georgia was rented. Elder Reese left the congregation and Elder White was sent from New York. Under Elder White’s leadership the church grew and a building at 199 Northside Drive was purchased. Elder White left to join Pentecostal Assemblies of the World and was followed by Elder Jackson for a short time. Elder Jackson left after a misunderstanding. Elder I. W. Bollinger, Pastor of Bible Way in Thomasville, was appointed pastor of both churches. Pastoring two churches became too much so Elder Frank Solomon was sent to Atlanta and the church continued to grow. Many souls were baptized in the Name of Our Lord and Savior Jesus Christ and saved through Bishop Solomon’s radio and television ministries. After the death of Bishop Frank Solomon his son Dr. Elijah Solomon became pastor of Refuge Temple in August 2005. Dr. Solomon has upgraded Refuge Temple by renovating the lower auditorium and expanding the church’s parking lot by purchasing the adjacent property located at 125 Joseph E. Lowery Blvd. Also, the property located at 933 Parsons Street S.W. 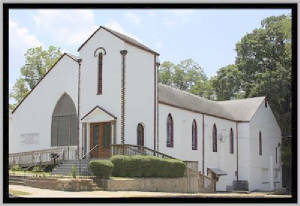 Atlanta was purchased and will soon be used to increase the church’s parking lot. Under the leadership of Dr. Elijah Solomon and First Lady Christine the ministry infrastructure has been upgraded to encourage greater fellowship and unity.